Why should people vote for Jill Stein for President instead of choosing the “lesser evil,” and why is this an effective way for the Left to build power? “It is better to vote for what you want and not get it than to vote for what you don’t want and get it,” as Eugene Debs said. My vote for Stein, the Green Party candidate, is a simple choice to support the candidate whose values and positions overwhelmingly represent my own. But I realize the choice isn’t so easy for those who are weighing whether to vote for Stein or choose the lesser evil of Hillary Clinton in order to defeat Donald Trump, the boorish incarnation of society’s most disgusting and violent attitudes. A Pew poll taken in mid-September found that overwhelmingly, voters on both sides of the aisle are choosing the lesser evil. The main reason respondents cited for supporting Trump or Clinton was dislike of the other major-party candidate. Given the high level of dissatisfaction with the choices put forward by the corporate duopoly, 2016 could be the year that independent parties, in particular the Green Party, make strides. Voters are increasingly sick of the policies of war and Wall Street embraced by corporate Democrats like Barack Obama, and Hillary and Bill Clinton. Yet there is tremendous propaganda pressuring leftists to swallow their pride and vote for Hillary Clinton, despite her political record. The most belabored meme is that Green Ralph Nader cost Democrat Al Gore the 2000 election, electing George W. Bush and leading to the Iraq War. This scare tactic ignores many important factors: A media review a year after the election found that a full recount would have resulted in a Gore win, but the Gore campaign demanded only a partial recount; that the Supreme Court stopped the recount by a 5-4 decision along party lines; that Bush is estimated to have won the votes of more than 300,000 Florida Democrats; and that half of all registered Democrats did not even bother voting. As it does with Jill Stein today, the Democratic Party made Nader and the Greens into the scapegoats. Why vote for Stein and the Greens instead of a lesser-evil Clinton vote in order to stop the “fascists”? Because we must stop giving legitimacy to the political elites of the two corporate parties, including the Democrats. Their policies have created the crises that surround us — the climate crisis, the jobs crisis, the student debt crisis that has 43 million of us trapped in endless monthly payments, and militarized policing instead of anti-poverty policies. While social change won’t happen solely through elections, they serve as a measure of popular will, and can be a tool for bringing issues and solutions into the public discourse. 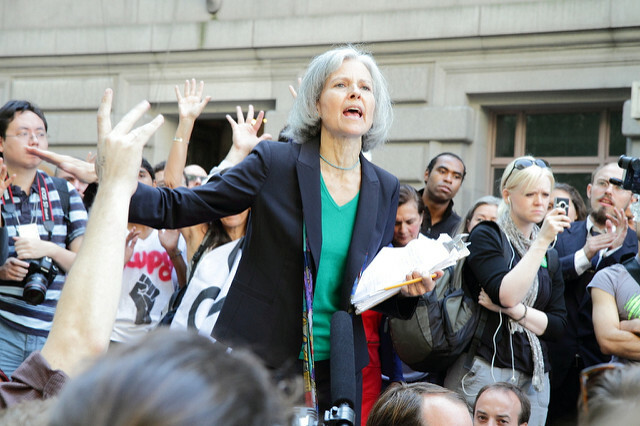 Though third parties in the U.S. face a political Mount Everest, competing under conditions and rules designed to exclude them, the Green Party has learned to navigate and challenge the undemocratic nature of the electoral system. The Sanders campaign demonstrated that there is a mass base for progressive policies. The higher the vote for Stein and the Green Party, the more leverage progressive movements can have against the political establishment, because it will not be able to take our support for granted. The Greens’ infrastructure needs to catch up with the public demand for a progressive alternative. If Stein wins 5% of the vote, the party would qualify for general election public funding in 2020 that will be worth over $10 million, which would significantly boost its organizing capacity. In 37 states, the results will also determine whether the Greens get an automatic ballot line for the next two or four years, though in New York the ballot line is determined by the results of the governor’s race which will next be held in 2018. Those lines would enable the independent left to run competitive and winnable races at the local level, which is how it can develop into a national electoral force. What will it mean if the only third party that wins 5% is the Libertarian Party? If popular discontent with the status quo of corporate rule is consolidated in the growth of a party that believes in the gospel of Ayn Rand and that fire departments should be privatized? Election Day will be a test of how much progressive voters are willing to break with the two-corporate-party system. Supporting Jill Stein and Ajamu Baraka could be the next step in building a mass-membership party of the left, and the next step for Sanders supporters who want the “political revolution” to continue. The Green Party has weathered 30 years and elected hundreds of progressive candidates at the local level. In Richmond, California, Gayle McLaughlin served two terms as a Green mayor, where she held the local Chevron oil refinery accountable for environmental violations and enraged big banks by saving residents facing foreclosure from eviction. The Green door is open to disciplined leftists and organizers who want to grow an independent grass-roots party that can compete and win while developing a clear vision of the world we want to live in. A vote for Jill Stein is a vote to assert our political power and our political aspirations. It’s a vote to end extractivism and militarism, and in favor of a political platform that prioritizes health and human rights, and puts people, the planet, and peace before corporate profits. Ursula Rozum is the Secretary of the Green Party of New York. 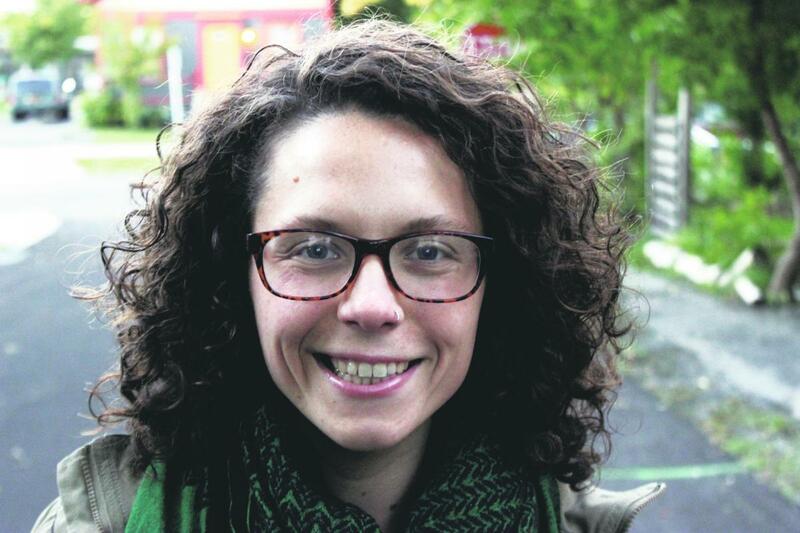 She is also on the Steering Committee of the Syracuse Peace Council.